It's been ages since I've seen anything from Giovanni, a brand I would usually see at Walgreen's. So, I was even more surprised to find the brand was sold over here. I found the Giovanni Hot Chocolate Sugar Scrub (9 oz/ 260 g) at Cosme Kitchen for 2,808 yen, but they were sold out; which turned out to be a happy inconvenience, because I found it on Rakuten for 1,400 yen (shipping included). Three cheers for that savings! 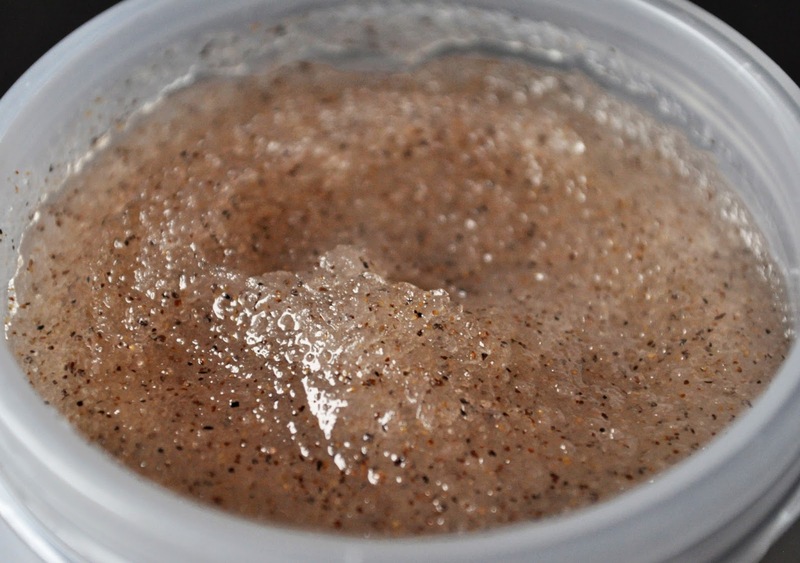 I have to begin with the scent of this sugar scrub, because it's that amazing! The rich, sweet, nutty-chocolate scent of Giovanni's Hot Chocolate Sugar Scrub is scrumptious! The scent is not synthetic, nor saccharin sweet, it just smells heavenly. Whenever I open the tub, I can't keep my nose out of it; I just want to dip my finger into the scrub and eat it. If you're a chocoholic, you are going to go mad for the scent. The simple, yet stylish, frosted, asymmetrical plastic packaging is very eye-catching. I really enjoy the way the surface and shape of the tub feels in my hand. Loaded with crushed cocoa beans, walnut shells, and essential oils, the scrub has a thick, grainy texture without feeling coarse on the skin. Frankly, on wet skin, I found the granules would quickly dissipate, causing exfoliating to be too gentle for my liking. Thus, I'll pat the myself off with a small towel, leaving my skin damp, not wet, to get my ideal exfoliation action. Afterwards, all dead skin has been buffed away, leaving my body smooth, polished, with an edible scent. Also, the sugar scrub has a warming effect as soon as it you start rubbing it onto the skin. Sadly, the sensation soon disappears after a few seconds into exfoliating. Giovanni Hot Chocolate Sugar Scrub contains 100% vegetarian ingredients (sugar, crushed cocoa beans, kukui nut, shea butter, vitamin e, aloe vera, and so on) is not tested on animals, and is free of parabens, lauryl, and laureth sulfate. 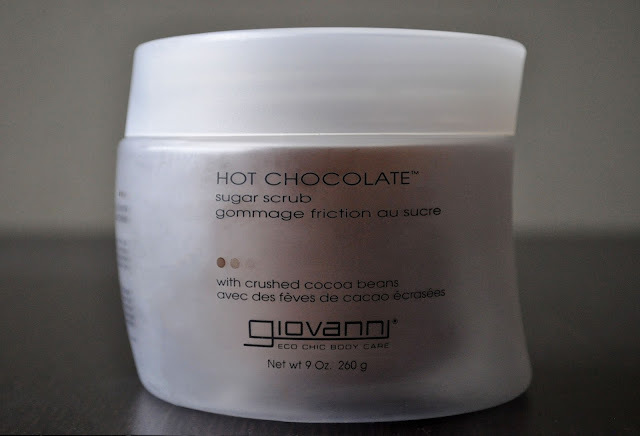 I really enjoy the Giovanni Hot Chocolate Sugar Scrub and would recommend it, especially during Fall and Winter. Have you tried Giovanni's Hot Chocolate Sugar Scrub?